If you look at the gdp numbers the US economy contracted by about 3.4% during 2009.. but then is on pace to grow 3.2% this year. The country went into the meltdown in the summer/fall 2008 with 155 million people actively in the economy. Employees and business owners. The continuing job loss has reduced the number of actively involved in the economy to about 140 million. Over the two years the US population has also increased by ~6 million. Which should have added 3 million to the active in the economy. So why has the economy been able to keep production at former levels? Huge rise in productivity. Last year the estimate was an astonishing 9% rise in productivity. Corporations under pressure fired hundreds of thousands of people who were redundant. If there are 7 big boxes in an area competing against each other, and that gets reduced to 5 big box stores.. it doesn't affect output. Anyone who wants to buy a new tv can still easily do it. The remaining stores are just running at a higher capacity utilization. The same thing is happening in areas of the economy like auto dealers, banks, insurance and similiar service sector areas. If half the auto dealers shut down would people go without cars? No the remaining dealers would just do higher volume and be more profitable. the economy is only growing because of government stimulus...and that is paid for out of the bottom line in the graph below...which is reducing and therefore month by month gets put under more and more pressure. Yes recessions have an amazing ability to cut out the dead weight in an economy. The overcapacity and overgrown bureaucracies. In the other thread you argued most of the new economic opportunity is going to come from people starting their own businesses, which I agree with. Possibly as rents fall with all this abandonded commercial space it will make new ideas viable. A radical idea I have is to free up medicine. Let non-pharmacists open pharmacies and perscribe all drugs, let non-dentists open dentistry clinics, let people open up plastic surgery clinics and stem cell clinics. Right now one of the main impedements is in most areas people are not allowed to start businesses. Good graph showing what has happened. 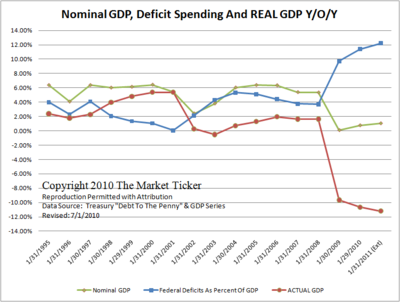 Imo the national deficit is going to have to get a lot bigger soon. Already inflation is well below the policy mandate and trending lower. The private sector cannot expand credit when it is already in overcapacity. Like the private sector is closing down auto dealerships not borrowing money to build new ones. Yes, of course you are right but your example of increased productivity also illustrates one of the main problems of this: the tendency to monopoly which then reverses the gains of "competition". I realise you didn't allude to this but it is one of the "issues" with capitalism. It always amuses me to listen to people like Bill Gates or Rupert Murdoch who are always lauding the merits of competition but are actually trying to create monopolies - look at what they do not what they say. your method leads to death. Id rather have a cure. Productivity always jumps in a recession. For example, imagine a car maker with two factories. Recession bites, they have to shut one down. They shut down the older less productive one, so they have half as many workers, but productivity has increased. There's no mystery to this, the productivity has jumped massively because it's a massive recession. But a rise in productivity leads to a rise in unemployment. The unemployed buy fewer goods and services. More businesses fold. Does this not also eventually lead to death? Death or death is the choice, apparently. And before anyone mentions it, the unemployed don't employ dog groomers. Even those in work only employ a limited number. We can't all be dog groomers. Cutting out the fat is good, it allows people and resources to work on new problems and in new enterprises, obviously it's not so great if you're the fat that has been cut, and if you find yourself in the wrong location, skill or age group. And then the economy recovers, and because they now only have one factory which is operating at maximum capacity, they're unable to take advantage of increased sales. Competitors eat their lunch, the stock price sinks, and then they get taken out in a hostile takeover. Any company can increase productivity by cutting investment in future sales. It works great in the short-term, but it's suicidal in the long run. Banks/Building societies - their sole aim, like the food industry is LESS for MORE! they have superior productivity and demographics to get them out of their hole, whereas we have default, as does Europe. Absolutely. They must be careful about their exposure to lawsuits should they not make clear to potential customers their state of training, but why not? Personally I'd steer clear of that one and can think of less risky areas where folk might turn to. The real problem they will have is the state of unreadiness amongst the population to switch from trained workdroneunit into free thinking entrepeneur, and that is emphatically not their fault!! is it really an unreadiness,or a regulatory straight jacket preventing them from doing so? if you were starting up a new business,do you really think you could afford to have oversight by armies of 'elf+safety,or take the risk of hiring an employee that is going to insist on taking his paternity leave,leaving you without cover for months on end? this is where big business has inherent flexibility that is not available to a start-up. and EVERYBODY has to begin somewhere. excessive legislation is beneficial to the behemoths,not the little guy. One point I wanted to make also is it is finally dawning on policy makers that it is unlikely these 15 million lost jobs will come back, or that new jobs will come to replace them. But the real fear imo should be over the next 15 million jobs. Since the powers that be have done virtually nothing to deal with the underlying problems, what is the expectation that it will not continue? I don't think we'll see 15 million more jobs lost in the next 2 years in America.. but it looks likely to go a grind of at least a net of 2 million jobs lost a year. There will be cyclical gains in jobs of course, but the secular trend you postulate is correct I think. Not only are manufacturing jobs lost, but as wealth gets concentrated even further there just isn't the need for all those service jobs to cater to the whims of the wealthy. How many people serving coffee and giving massages will we really need? The political dynamic of this will be interesting to watch. Yes I believe the mass jobs come from a mass market of average people with real buying power. Someone gave an analogy if you were trying to sell cell phones, would you rather try to sell to 1,000 people who each were worth 1 million dollars, or 1 person worth 1 billion? the jobs always come back. wealth is what we dig or grow out of the ground. money overissue gave the false impression many men were "worth" more, much much more, than their productive capacity. the impression was false....here is the clue.